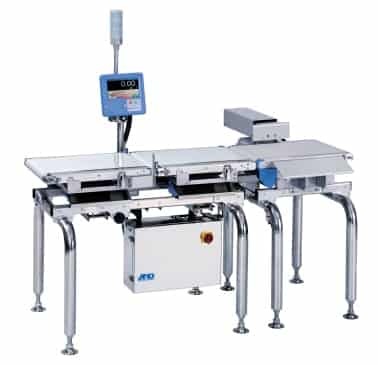 Checkweighers ensure product is not over or under-weight. 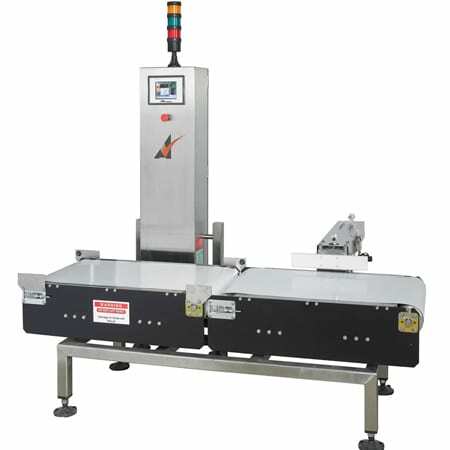 They convey product over segments of belts that rest on load cells, which provides an advantage when weighing heavy product, and a disadvantage at very high belt speeds. 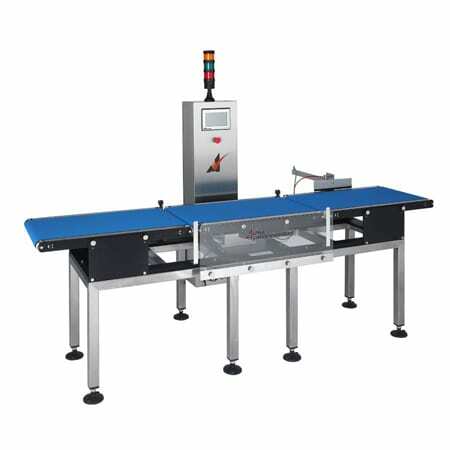 They are typically low-cost, single-use machines but can be fitted with metal detectors as well. 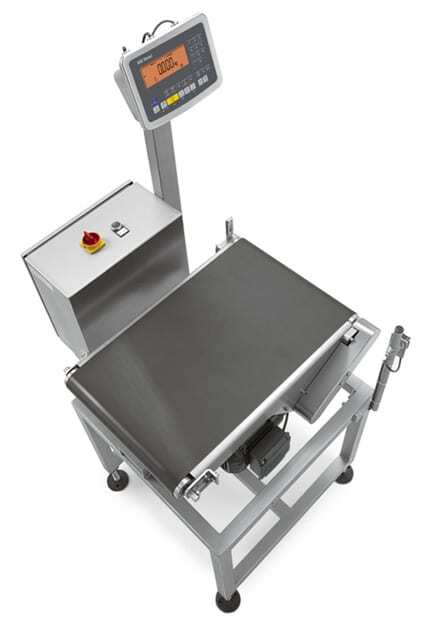 Your Checkweigher should have only the features you need right now plus a few that will help in the near future. 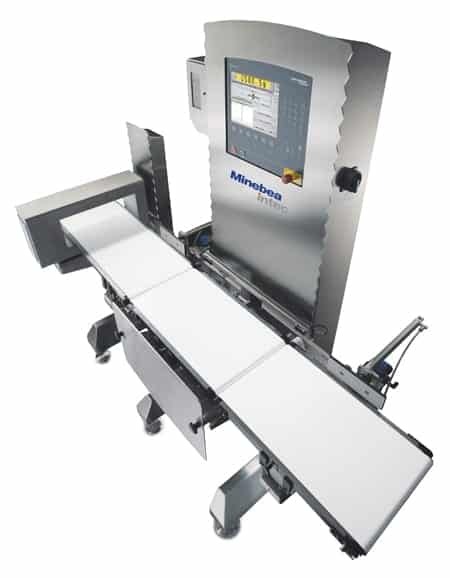 Simpler machines reduce up-front and maintenance costs, but are wasteful if they need to be replaced soon. There are numerous manufacturers but we’ve found Minebea, Alpha, and A&D to provide the best value for the dollar at different price points. All three makes can be integrated with metal detectors. They each will have their own conveying and rejection methods, but we can alter or build these in-house as needed. Minebea is out of Japan and is the most solid, highly engineered make of the three and carries options for the most demanding applications; but they’re not necessary for everyone. Second, they’re engineered to be cleaner. By minimizing flat surfaces, water and product is kept from collecting. By minimizing grooves and parts, ingression and bacteria buildup are minimized. And by maximizing surface exposure, product and dust can be cleaned off easily ingress does occur. Third, more time was put into the internal coding. They’ve taken measures to make their data traceable, allowing for better line diagnostics. 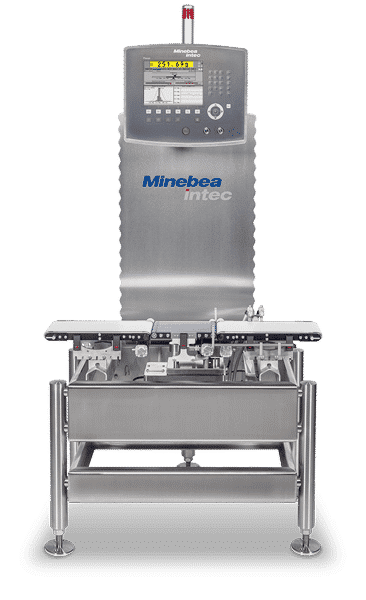 Any time you’re dealing with high-precision, high speed, or products that cause issues with machinery, Minebea is the best bet. Alpha is a quality, all-around manufacturer that fits most applications. 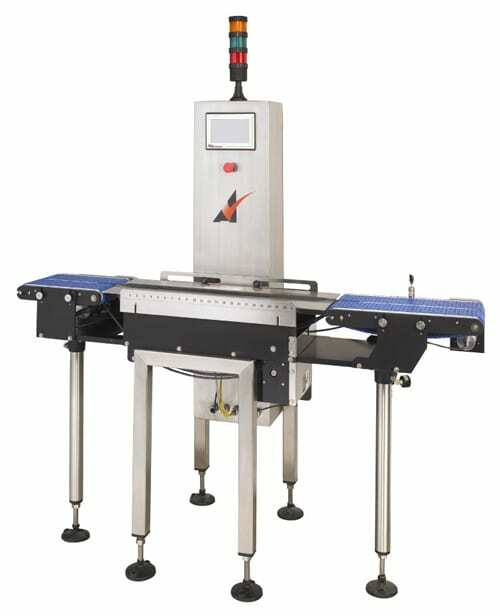 They have a large selection of models and numerous configuration options for each of them. And, being based in the U.S., they provide some of the best support. Their models max out around 350-400 pieces per minute, but this is usually plenty. This often makes Alpha the best choice for non-specialty and bulk applications. 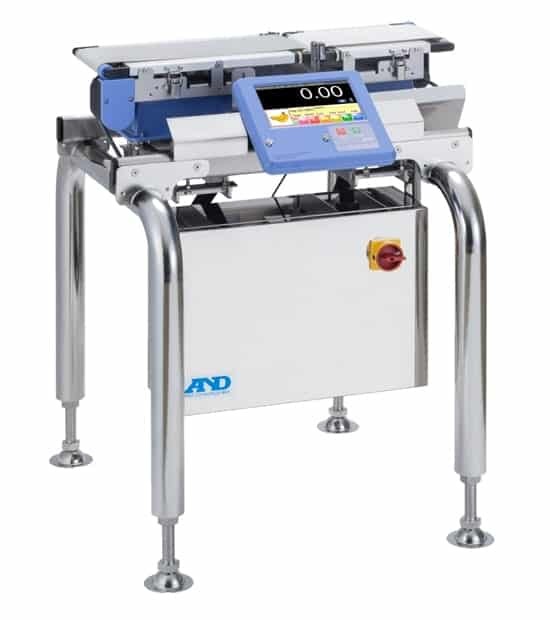 For the most part, A&D’s checkweighers are different configurations of the same machine. Though it can’t fit all applications, it covers many of them. The big up-side here is that economies of scale reduce machine and part costs, and machines can be more easily retrofitted. 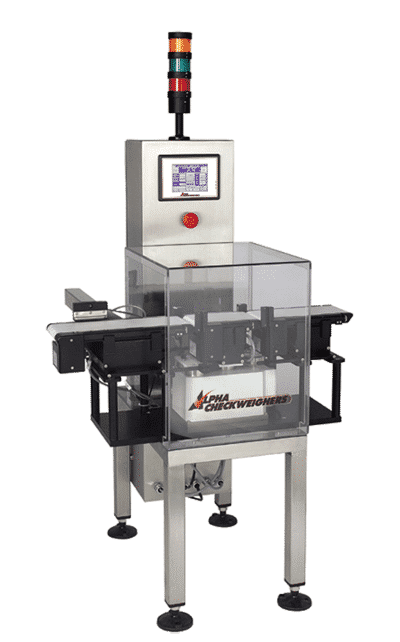 This is not to say A&D doesn’t make good machines; they’re accurate, they have speeds up to around 400 pieces per minute as well, and they don’t need a ton of maintenance. And when parts are needed they’re shipped from California, which is nice in a pinch. 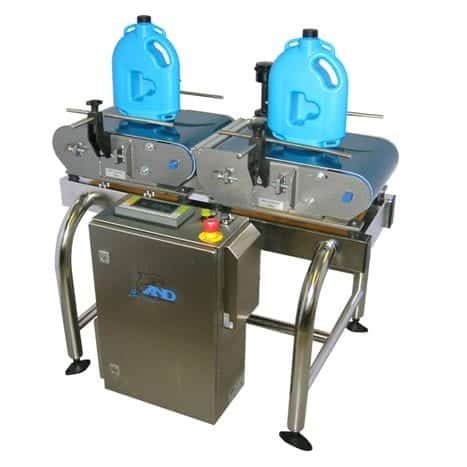 A&D’s machines are simple and low-cost, making them great for quick starts and when a product’s viability is uncertain. Many factors will interact to determine which option is best. Just fill out the form to the best of your ability and we’ll help identify the right ones.